The company culture - 'the way we do things round here' - has a decisive impact on competitiveness and profitability. Changing and harnessing the company culture is also the vital first-step in any improvement programme. But how do you assess objectively something as intangible as company culture? how to present and use your audit findings. 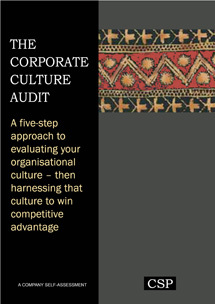 There is little doubt that culture strongly affects the functioning of any organisation. But there is still little awareness among managers about how to uncover, evaluate and improve that culture - so that it works to reinforce the corporate strategy. The most effective way to identify the critical values and assumptions shared in a company is to conduct a culture audit. But, however you use the audit, it will give fascinating insights into the way your company works. Every organisation should undertake it.